Crochet this baby cocoon with matching hat and use it as a cute Halloween costume, photo prop, or just a warm sack to tuck a baby into. The ridged lines give it the distinct pumpkin look. Feel free to customize the cocoon by sewing or embroidering on your own jack-o-lantern face! You can even omit the pumpkin’s stem to create a traditional baby cocoon set. This pattern can be downloaded in the Crochet Spot Store. 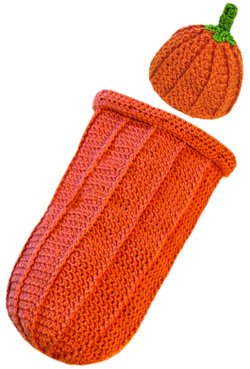 Need help while crocheting your pumpkin baby cocoon or hat? Just let me know and I’ll help! This entry was posted on Thursday, September 9th, 2010 at 7:37 AM by Rachel Choi	and is filed under Best Crochet Patterns. You can follow any responses to this entry through the RSS 2.0 feed. You can leave a response, or trackback from your own site. I love it too! I know just the little person to make it for. I like this! To bad I’m out of orange colored yarn. My son just couldn’t wait for a pumpkin hat of his own. I’m gonna remember this so I cant make one for next baby coming soon. 🙂 Thanks for sharing this with us. Is this DC? I am not a fan of SC. This is adorable. I am looking for similar item – the hanging cocoon or pouch. I have had difficulty finding these online. I like to try free patterns to get the idea, see if I like it, etc.before buying. Any chance for a free pattern for this item? Can I buy the pumpkin cocoon and hat from you? I purchased this pattern. Received the email confirming the payment to you from pay pal. If you need more help, feel free to send me an email at [email protected] and I can email you the pattern instead. Is the pumpkin cocoon the same pattern that you used for the peanut cocoon? Hi Kristin! We don’t have a peanut cocoon pattern on the site at the moment. You may be confusing it with a different website? I can imagine you can use the same pattern and crochet it with a brown/tan yarn and it would look like a peanut!